Is Your Logo Doing Its Job? | LunaGraphica, Inc.
Why do we use logos? Before deciding if your logo is doing its job, it is important to understand what your logo is supposed to be doing for you in the first place. The creation of a logo is one of the earliest steps taken in the process of establishing a brand, or breathing new life into an existing one. It’s easy to get wrapped up in the excitement of this process and lose sight of the bigger picture. Your logo is the face of your business, it is what people will see first, remember, and recognize you by. Your logo should be able to tell your customers/target market what your business is about in a glance. Though some may see a logo as a simple detail, this couldn’t be further from the truth. Ideally your logo will be able to briefly but clearly tell your audience who you are and what you are offering them, but it needs to go a little deeper than that. A logo should represent the attitude and values you want your business to be known for. Are you a business that needs potential customers to know you are professional and serious about your work? Are you a fun and relaxed business wanting potential customers to understand this is what they can expect from you? These things can and should be conveyed through your logo. Knowing this, you can see why we never recommend going with a generic logo that comes from some online or office software template. Being the face of a brand is no small task and it shouldn’t be taken lightly. But if it all sounds a bit overwhelming you can relax, because we’ve got your back! Whether you are starting from scratch or redesigning a logo that just isn’t cutting it, our tips and pointers will help you understand how to make your logo work for you and your brand. Because your logo has such an important job to do there can be a tendency to cram as much into it as possible, but this almost always backfires. Logos that are too busy, loud, or cramped tend to be overwhelming for potential clients/customers. In most cases people will not spend enough time looking at your logo to figure out what goods or services you are offering. This means if they are remembering anything about you or your company it is how awful they think your logo is, and no one wants to be remembered for a bad logo. 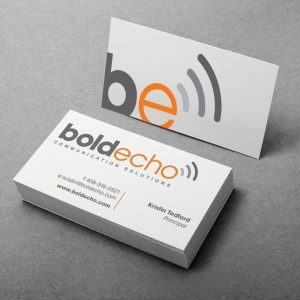 This logo we designed for BoldEcho is a perfect example of clean, simple design making a huge impact. We have used a single, easy to read font and kept it limited to a two-color scheme. Although straightforward, the subtle symbolism in this logo tells the intended audience exactly what they need to know about the company. By using bold type on the word “bold” and including the universally known symbol for sound transmission, the logo makes us think of clear, effective communication. Combining the vibrant orange with grayscale colors creates a bright and energetic feeling. Because the design is simple, it does all of this while maintaining the level of professionalism and clarity both BoldEcho and their clients expect. Think uncomplicated symbolism when planning your logo. Color is an effective way to grab the attention of viewers, but when it comes to logos we mustn’t forget few things visually set tone and mood like the skillful use of color. Yes, you want a dynamic logo that is going to draw attention to your products or services, but we want the logo to do so in a way that tells potential customers more about your business. It doesn’t make sense for a conservative law firm to have a logo that uses multiple neon colors, does it? I mean, would you take that firm seriously when all you have to judge by is the logo? On the flip side of that scenario, what would you think of a children’s party planning business that used a drab or grayscale color scheme… not very fun, right? Use the emotion color stirs to your advantage. Take this logo for we did for Smarttab as an example. This company provides and maintains point of sale systems for bars and nightclubs. Owners and managers are looking for reliable and easy to use systems so their businesses run as smoothly as possible. 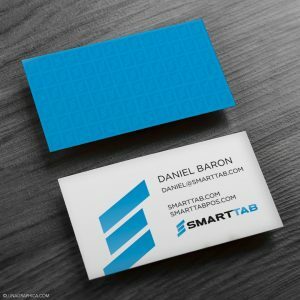 By using blue with black in this logo Smarttab is assuring potential clients that they are trustworthy and easy to work with (think true blue). Imagine if they chose to use multiple colors, or a brighter color scheme. How would that change what this logo says to us? The overall calming effect of the blue used makes viewers feel at ease right away, where other colors may bring about emotions causing stress or uneasiness, and end up sending an entirely different message to the target market. 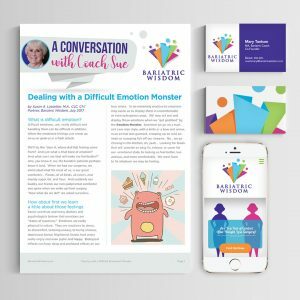 Our client, Bariatric Wisdom needed something else from their logo and color played a huge roll in the inclusive message they wanted to send. The use of multiple colors is intended to represent people of many backgrounds and situations coming together and being supported. The real power of emotion comes from the fun and lively colors they chose to use. The client wanted the logo to be approachable and hopeful; our design suited their needs perfectly and gave us a lot to work with when moving forward with developing their branding package. The font you choose for your logo can honestly make it or break it. First and foremost, if people can’t read it they aren’t going to know who you are. In an effort to turn heads and jazz up a logo, some may be tempted by highly decorative or novelty fonts. Though they can work in limited circumstances, it is important to weigh their use carefully. Ask yourself why you want to use the fonts you are considering. 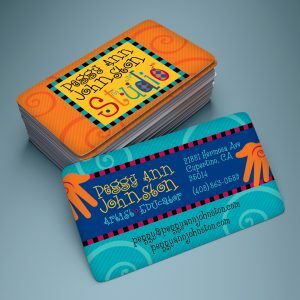 Do they add to your message or are they serving as a flashy design crutch? One thing you will find in common with all of our previous examples is their use of very professional fonts. They are clean and easy to read and they work for those businesses because they need to express a certain level of seriousness about their goods and services. Let’s look at some people and businesses whose products and services are more based in the arts and creativity, because this is the perfect time to use a legible yet decorative font! 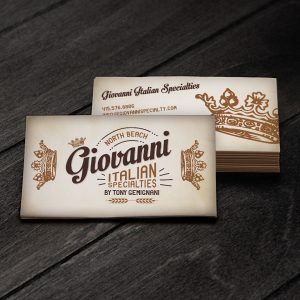 When we designed the logo for Giovanni Italian Specialties the goal was to give it the feeling of an Italian neighborhood market. The logo needed to feel classic, reliable, and trusted. We wanted to put a modern twist on this logo while keeping it steeped in tradition. The chunky script font paired with the nice, rounded san serif font make you feel as if you are looking at vintage signage for an old “mom and pop” store. It immediately gives viewers confidence in the business’s expertise, and the care taken in making and curating products. Once you have your logo created it is important to be consistent in the ways you use it. Most designers/companies come up with strict branding guidelines that tell others who may work with their logos how they are to be used. It is important to not deviate from those guidelines because a logo is supposed to be recognizable… if you change it from use to use, or use it in different ways, you are just making it harder for returning customers/clients to find or recommend you and your products. 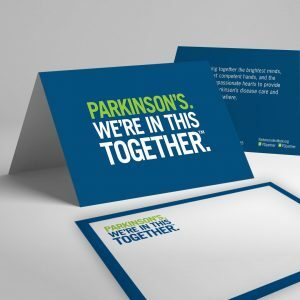 We often do design work for the Parkinson’s Institute, who already have an established logo and design protocol. When we use the logo in making things like this thank you note card, or for business cards and newsletters, we have to be careful to respect the guidelines provided for us in order to maintain brand consistency. 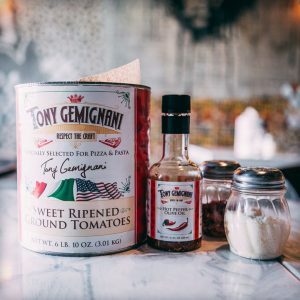 Tony Gemignani keeps us busy designing logos, signage, menus, and websites for his restaurants and product lines. Each of his restaurant chains has a different logo and they are consistently used to ensure they are all unmistakably their own entities. Tony also has his own logo that he uses for his personal website and ventures, and he recently branched out into creating his own product line. Maintaining the consistent use of his logo on product labels has been key in establishing a recognizable and trusted line of products for him. Logo design and branding is some of the most exciting work we do here at LunaGraphica. It is always fun and challenging to be a part of building a brand from the ground up. Have a look at more of our logo design and branding work to see just how versatile our designers are. Need a new logo? Want to revamp your existing logo to make it work better for your business? Contact us for a bid today!